I have almost made it to the end of my pregnancy. It is a busy time for my little family. Especially preparing for the babies arrival. It is pretty exciting when you make it to your weekly doctor appointments because you know that things are getting close! I was starting to panic because I really don’t have anything. Except for 1000 bows. 🙂 Luckily I have got some amazing blogger friends that threw me a baby shower on Saturday! 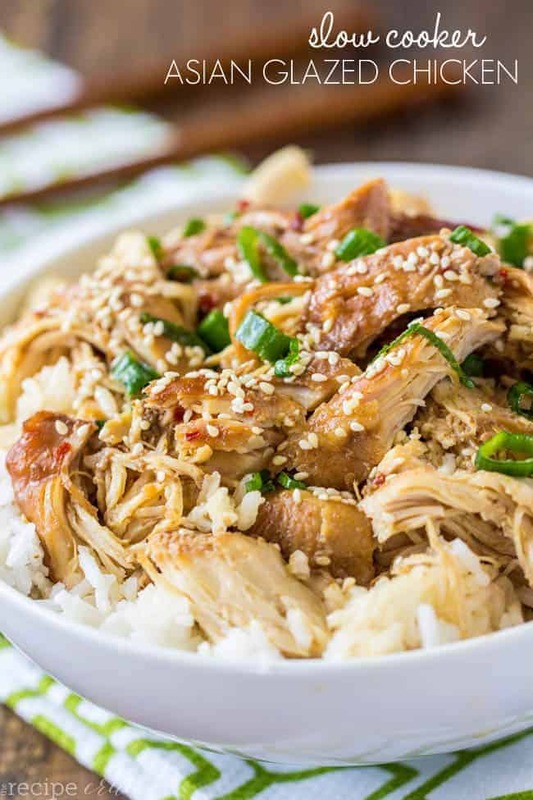 Amazing asian glaze chicken that takes 5 minutes to throw into the crockpot and has amazing flavor! Spray slow cooker with cooking spray and add the chicken breasts to the bottom. In a small mixing bowl combine soy sauce, sugar, lemon juice, Worcestershire sauce, ginger, red pepper flakes, minced garlic and pepper. Pour sauce over the chicken. Cook in slow cooker on low for 4-6 hours or high 3-4 hours. Once done cooking, remove chicken from slow cooker and shred. To thicken the sauce up, pour into a saucepan and bring to a boil on medium high until it starts to thicken up. Add tablespoon of cornstarch if needed. Serve over rice and top with glaze. Garnish with sesame seeds and green onions if desired. Alyssa, this looks amazing. Gotta love the slow cooker. You’ll have a bow for every outfit. Pinning! I made this tonight and it was a hit – even with my somewhat picky 4 year old! However, despite going back for seconds, and knowing we will eat leftovers of tomorrow night, there is still a lot left. Have you ever successfully frozen and reheated it later? Thanks for sharing the recipe! Any chance you can use ground ginger and get the same taste? Yes I have done that before. Ground ginger will be more potent so reduce the measurements. I can’t wait to,try all of the chicken recipe. I will try a couple of these starting Monday. Thanks. I will be looking for several of your cook books. Can I use rice vinegar instead of the lemon juice? The Asian Glazed Chicken was to die for. It was such a fantastic quick and east recipe, and it’s also extremely yummy. Who can beat that! I’m definitely going to make this again, maybe add it to a stir-fry, tasty!! Thank you so much for bringing back a bit of inspiration to my Crock Pot Alyssa! Over all you should definitely give this a try! Delicious.